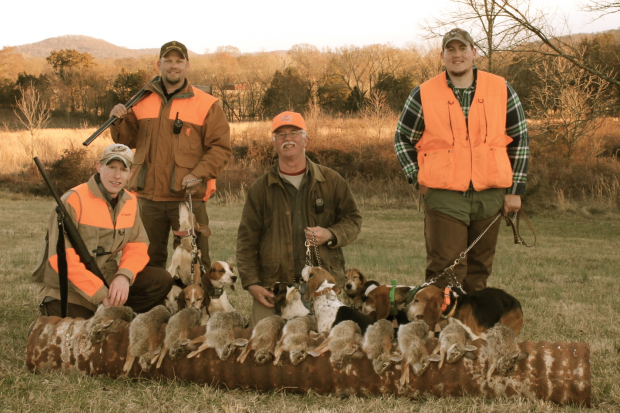 We consider our beagles successful anytime they drive the rabbit to the gun or to the ground. The rabbit dogs are supposed to account for their game and to follow the track they are pursuing until it is completed. While we certainly prefer for one of the hunters to shoot the rabbit, the little hounds have done their job equally well if the rabbit is driven to seek refuge and go underground. In this case the dogs will often “show” us the hole or rock pile where the track ended. This video shows the beagles being successful in driving the rabbit to the gun and to the ground. We were fortunate to shoot 15 rabbits over one-and-half days of hunting, and the dogs put another 7 rabbits in the ground. Only, two or three rabbits were able to escape by simply loosing or out smarting the pack. Loved the video. ? What type of bells r u use n and how r they connected to the collar.thanks and happy hunting.i live in n.c and been rabbit hunting for54yrs and still loving it.